Clean groundwater is a vital resource, fundamental to our everyday activities, health, economic well being and ultimately our survival. In the City of Chilliwack, water is obtained from the Sardis-Vedder Aquifer, a natural underground water reservoir. Due to the permeable nature of the soils overlaying the aquifer, contaminant migration into this groundwater resource is a concern. You can assist the community by taking measures to prevent chemical and waste spills by ensuring that all hazardous materials are transported, stored, and disposed of correctly, and by working with other members of the community to minimize activities that pose a risk to the quality of our groundwater resources. Where is the Sardis-Vedder Aquifer? 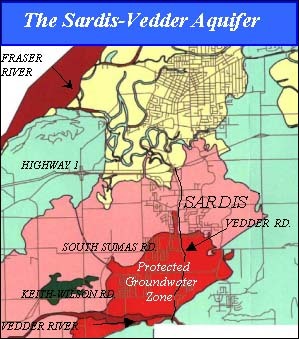 The Sardis-Vedder Aquifer is particularly vulnerable to contamination for several reasons. First, the upper layer of groundwater, the water table, lies only a shallow five to ten meters below the ground’s surface. This is significant, as chemicals or waste materials must travel only a short distance through the soil to impact groundwater quality. Second, the boundary layer of soil protecting groundwater from the upper surface is coarse-grained and consequently extremely permeable. Rainfall quickly seeps through the pores of the coarse soil, carrying contaminants from the surface to the aquifer below. As Chilliwack receives high rainfall, particularly during winter months, preventing the ingress of contaminants due to surface spills is essential. It should be noted that the City’s wells pump water from a much deeper zone and water is pumped from a depth of 30 to 40 metres below the ground where the volume and quality of the groundwater is very high. *Note: Hazardous materials are any products that are ignitable, toxic, corrosive or explosive. Residents can help protect our valuable groundwater by following the guidelines listed in this section. In Chilliwack, we have good reason to be proud of our drinking water. Chilliwack has great groundwater, let's all help to keep it that way!This document outlines the characteristics of our aquifers, our current and future use of them, as well as the potential threats they face.